Joe Slattery receives his Man of the Match award, donated by Roddy the Dog Walker, from sponsor Charlie O'Brien after Saturday's game. 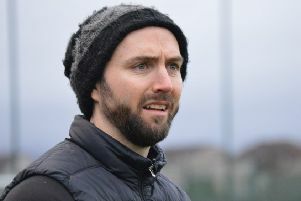 Rob Roy boss Stewart Maxwell admitted his side’s performance against Irvine Meadow on Saturday was their worst of the season. 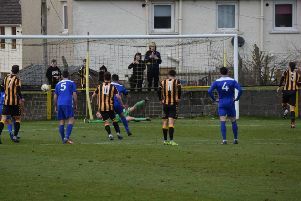 The match, won 2-0 by the Ayrshire visitors, was Rabs’ first game for four weeks and Maxwell felt it showed. He said: “We’d not played for a month and it looked like that. We looked ring rusty and they deserved their victory. “We just didn’t turn up and it was the poorest performance of the season for me. “We didn’t pass the ball, we didn’t press, everything was slack, sloppy and we got what we derserved out of the game - nothing. “It’s frustrating. I knew how Irvine Meadow would play, they’ve got good cohesion and team spirit and they’ll come and they’ll battle. They’re quite physical and with the weather we knew it was going to be a battle. “Our biggest problem is we try to play too much football at times and we need to learn to change that. “We got caught trying to pass our way out of trouble and end up conceding a free-kick. The boy’s whipped in a decent delivery and they’ve got a free header with us not picking up. Rabs’ task now is to bounce back quickly, although they probably couldn’t have picked a tougher game to do it with a trip to Auchinleck Talbot this Saturday. Having reached the last 16 of the senior Scottish Cup, Talbot are the junior game’s flagship side at the moment. And while Rabs have had some decent results and performances against Talbot in recent seasons, Maxwell knows just how difficult Saturday’s match at Beechwood Park will be. He said: “It’s going to be a really tough game, but we’ll see if they’ve got a bit of character. Hardly anybody’s gone down there and got a result this year and we need a reaction from Saturday. “We’ve got a decent squad here and last week we stressed to them ‘keep yourselves in the team with your performances. If you don’t you run a risk’.